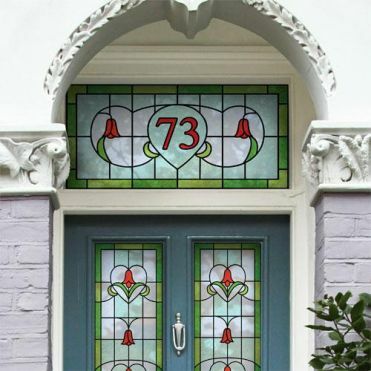 Art Nouveau stained glass house number sticker ideal for a front door or a transom. Resized to your measurements with your own number. Easy to apply in minutes. Using our service, you'll be able to order a stained glass effect house number sticker printed and scaled to your exact dimensions and requirements. The end product is a cost effective alternative to stained glass, and is very easy to install. 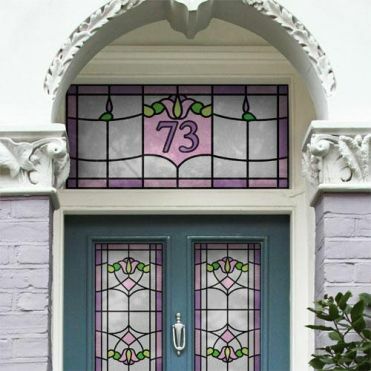 The following designs are created by printing the design, including your number on a clear film, to allow the maximum of light through, or on a frosted film for extra privacy. You'll also have the option to order matching panels to go on the rest of your windows. All the designs are inspired from original period stained glass designs from the Art Nouveau era.